Lisbon, a city on seven hills, European San Francisco, a little bit of Rio de Janeiro, she greeted us with multi level clouds in the sky, white waves in the ocean and a marvelous Capo da Roca, the most western point of the continental Europe. We were lucky to find an Airbnb with a magnificent view over the city and could enjoy splendid sunsets while our little one was peacefully sleeping in another room. That kind of view, together with that being a quiet district, beats proximity to the center and other attractions. Beautiful views and quiet nights mean you have to get to the centre by transport. Tram 28 is famous for a reason – it will take you through the winding labyrinths of central streets with their ups and downs. But this tram is not just for tourists – local people use it too. The elderly, disabled, pregnant and passengers with small children have priority here and the driver asks reluctant passengers to give place to the most needy ones and helps them to get on. There are buses too, they lack the charm of the trams and their ability to get into the heart of the city, but are not so crowdy. Trams and buses have schedules but in our experience they were always late. Even though the fuel is not cheap in Portugal, the taxi is. The most convenient way of getting a taxi is through the app mytaxi – you can call the car, see its route, pay and tip through it. We started our city tour with the nearest streets which brought us to the Amoreiras shopping center. Apart from good shopping opportunities, this mall has cinemas, a diverse food court and a playground. But we went there mostly for the Amoreiras 360 panoramic view over the city of Lisbon from above. There are no crowds of tourists and we had lots of time and space to enjoy our time there. Our toddler also liked lots of room to run around and the beautiful view. There was one more attraction next to our Lisbon home – Campo de Ourique Market – probably the best market (and restaurant at the same time) we’ve ever visited – you can not only buy fresh fruit, veggies and other products there, but also take a table and savour delicious specialities: maminha, picanha (though of Brazilian origin but still very good here), seafood, fish (mostly cod), various side dishes and desserts, including their famous Pastéis de Nata. In the morning most of the market stalls are closed but you will find something for breakfast too – there’s a wide variety of coffee and buns to choose from. The market had a pleasant surprise for us – a kids corner and a small library. A distinctive feature of a market is that it’s a place where local vibes are probably felt the most, and that’s what we like – not just to see all the monuments, museums and other sights, but to see the local life and people. Alfama is the hilliest city center we’ve ever seen – no wonder the tram and nimble tuktuks are so popular with tourists. It’s quite a struggle to walk with a stroller there but manageable, though not everywhere. 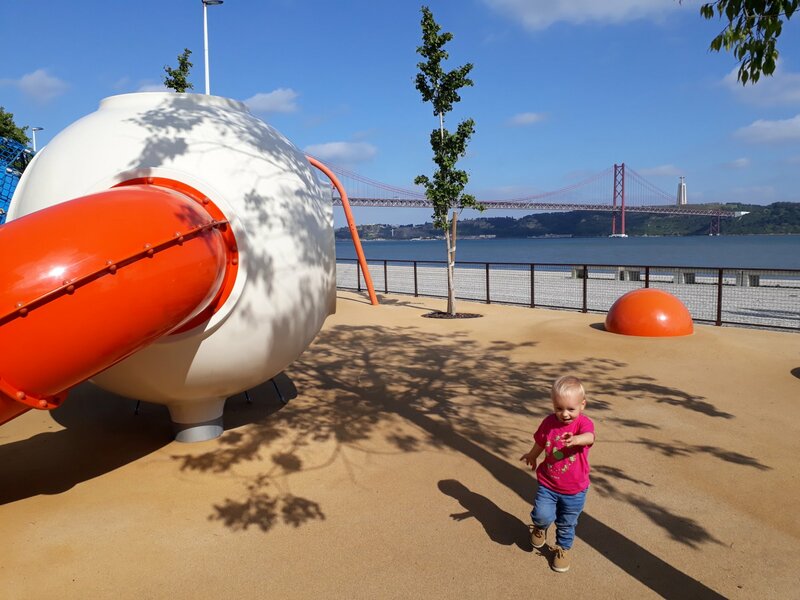 Some people suggest taking a sling/ baby carrier for at least this part of Lisbon but we’d say it works if your child is small enough and likes to sit in the carrier. Our 2 year old toddler had certainly grown out of the previously beloved backpack carrier – she doesn’t like it anymore, so we opted for a stroller and it was ok. We went through Alfama with a tram, walked to a nice view point we spotted from the tram, then walked a bit more and called the taxi – the Alfama hills can be exhausting, especially when it’s too warm. They say, Belem is the most walkable part of the city. Yes, if you don’t go beyond the esplanade. If you are as crazy as us and go up the street, you will find that the hill will never end, then you want to go back to the flat surface and have to move downhill. But even though the streets are not so easy to walk, you can discover a different Lisbon, a real one, with local people running their errands or chatting in the streets, with houses built in extraordinary places, on rocks and cliffs, those things that you won’t see in the touristic city center. The esplanade stretches for as far as one can see, you can spend a whole day there: stroll, bike have a meal at one of the restaurants with a magnificent view of Tagus and the bridge, and the kids will be delighted with the playgrounds. The esplanade and the city are separated with a highway and you can get over it via bridges with no lift, which means you have to carry up and down the stairs. When you’ve had enough of the city tourism, it’s time to go West. Sintra is 40 km away from Lisbon and is famous for its castles. We found this place surprisingly rich with fine food restaurants and incredible desserts. You can get to Sintra by train and take a bus to Cabo da Roca. Or you can rent a car for a day and save some road time. We first opted for the train but on that day there was a strike. A passing by passenger told us so but none of the station workers seemed to care to inform the waiting passengers that there were no trains that day. It was a struggle to find the information on their site either. As the strike was planned for two days, we rented a car for the next day and saw the Western Point of the continent with comfort. Cabo da Roca is as windy, as a cape normally is, a bit chilly, and offers beautiful views over the Atlantic Ocean and the shoreline. But the best of the cliff you can see from the sea or the sky. 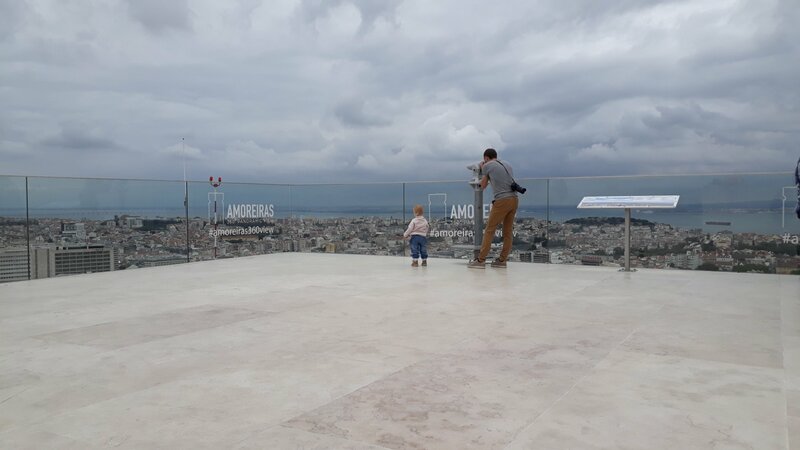 Of course, our list doesn’t exhaust everything that Lisbon has to offer but it was just enough for our 4 days with a toddler there. Now it’s time to hop on the train and go to Porto.